Linea Directa Aseguradora are a market leader in direct car, motor and home insurance in Spain. Linea Directa are in fact the Spanish Direct Line insurance operation which you may be familiar with from the United Kingdom. If you are searching for Linea Directa in English you are in the right place because Linea Directa have English-speaking staff and policies worded in English. Please note any reference to the word seguros is a reference to the Spanish word for insurance. Linea Directa began in 1995 in Spain through the joint agreement between Spanish bank, BankInter and Direct Line Insurance, a market leader in telephone sales of car insurance in the UK since 1985. The unique formula of Direct Line was to have a telephone call centre instead of a national branch network of offices. Despite the initial reluctance of customers in Spain, Linea Directa experienced success due to its cheap quotations for car insurance in Spain – often beating competitors by up to 50 percent and a massive exposure via television advertising extolling the advantages of using the popular red phone which is part of the logo. Led by Maria Dolores Dancausa who was awarded in 2007 by the Association of Women Entrepreneurs of Madrid (ASEME) in recognition of her career and commitment to equality for women, today the company ranks sixth in terms of turnover, with a market share of 5.1 percent. Although at its inception it only sold car insurance, now you can also take out motorcycle insurance, quad insurance, comprehensive medical treatment and since 2007, home insurance. 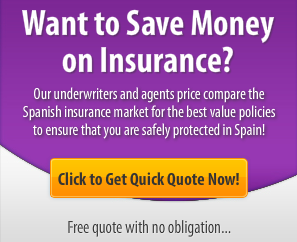 Are you searching for Linea Directa car insurance in Spain or Direct Line car insurance Spain? Linea Directa are the Spanish equivalent of United Kingdom based Direct Line Insurance and are 100 percent owned by Bank Inter. Linea Directa has a commitment to a strong quality of service and personal customer attention and care. Linea Directa Aseguradora offers English and German speaking support staff and policy documents in English and German which is why they attract so much business from expatriates in Spain. At the time of writing it is not possible to take out pet insurance, life insurance, marine insurance or travel insurance. Fully comprehensive car insurance from just €299. SME motor policy (fleet insurance). The familiar brand name is a reassurance to people who know that in the event of a problem such as needing help with repairs and claims in the event of an accident in Spain, they know help will be on hand at the end of a phone. They operate in a similar manner to Direct Line Insurance in the UK in that they specialise in competitive low-cost cover over the telephone. They don’t have offices in Spain nor do they use brokers or agents, this usually means their overheads are low and this is usually reflected in their quotes. Línea Directa has grown its customer base to over 1.7 million customers and it offers a range of products and services that include car and motorbike insurance, as well as extensive and exclusive home insurance, specially designed to satisfy all the personal requirements of expatriates. Car and motorbike insurance Spain customers have access to unique services which are not available from other insurance companies, these include night-time assistance and for medical treatment in the event of accidents. However there is also the possibility to find them on price comparison websites such as Acierto.com. These price comparison websites are a new development in Spain but clearly major companies such as Linea Directa have to adapt their business model or get left behind. These would include contacting local insurance agents and brokers. Brokers such as Knight Insurance are very good in providing English-speaking service and being able to compare prices from many different Spanish insurance companies. Spend a little bit of time yourself searching the Internet on the price comparison websites and then you will be able to definitively know which company is offering you the cheapest car insurance. In making your choice don’t forget that support and service are very important. Unfortunately the probability of having a car accident in Spain is relatively high so being able to contact a large company with plenty of customer service staff is important. Do note that Linea Directa will not insure a car in Spain unless it is registered in Spain and on Spanish license plates. This means that taking your car from the United Kingdom to Spain is not an option unless you re-register it in Spain. Although primarily known for offering competitive car insurance in Spain, since 2008 Línea Directa Aseguradora has now branched off into the very popular home insurance market. Why not give them a call to get a quote for home insurance. After all – with over 100,000 customers in Spain they must be doing something right! They offer competitive prices and coupled with a commitment to customer service you know you will be able to go back to them and speak with somebody in English or German if there’s a problem with your home insurance. Below are contact details if you need to cancel your policy or make amendments. We get many e-mails and phone calls from people who are incredibly frustrated at trying to find the e-mail address or phone number for Linea Directa. It does seem they have made it very difficult to get in contact! Línea Directa Aseguradora Ronda de Europa, nº 7, C.P. 28760 Tres Cantos. Madrid. Business Apartado de Correos 151, C.P. 19200 Azuqueca de Henares. Guadalajara. Claims Apartado de Correos 83, C.P. 19200 Azuqueca de Henares. Guadalajara. Customer Service Apartado de Correos 68, C.P. 19200 Azuqueca de Henares. Guadalajara. Motorbikes Apartado de Correos 68, C.P. 19200 Azuqueca de Henares. Guadalajara. Home Apartado de Correos 68, C.P. 19200 Azuqueca de Henares. Guadalajara. From this main page of the website you will see an option for Linea Directa in English if your Spanish is not so good. You can also go to the company’s customer support page and fill it in with the necessary details before hitting the send button. Linea Directa has a 24 hour service on its website (see above) where you can go online and modify your policy, ask for documents and make a claim etc. To telephone and speak to an agent or customer service representative, opening hours are Monday to Friday from 9:00 a.m. to 7:00 p.m. and Saturdays from 9:00 a.m. to 1:00 p.m. If you have any experience of using Linea Directa in Spain, please help us by making comments below in order to help other people searching for insurance in Spain. Linea Directa are a popular choice for expats looking for insurance in Spain because the company are a very established brand name and expats are familiar with Direct Line insurance in the United Kingdom. They know that they are dealing with an established and professional company who will be able to help them should they need to make a claim on their insurance policy. Linea Directa have English speaking support staff and policy documents in English. They operate in a similar manner to Direct Line Insurance in the United Kingdom in that they specialise in competitive low-cost cover over the telephone. Linea Directa in English is also possible online via their website which has a specific English language section. Linea Directa don’t have offices in Spain nor do they use brokers or agents, this usually means their overheads are low and this is usually reflected in their quotes which are normally amongst the cheapest insurance available in Spain. Page Summary: Linea Directa Aseguradora are a Spanish insurance company offering low-cost and cheap car insurance for vehicles based and registered in Spain. Ive been using them for two years, as have a couple of friends. Have needed them on a number of occasions and have been very happy with the service! I had insurance cover with them for 2 years and when I contacted then for a ligament claim they said I was not covered. Useless company, cancelled policy and will never insure with then]m again. I have been a client of linea Directa for 14 years, in the past they have been superb if you have been involved in an accident,,,,,,,,Not Now they contacted me to say the other insurance company had accepted responsibility for the crash I had a couple of weeks ago and take my car 20 miles away from where I live to their designated garage to get a quote,and then sometime in the future take it all the way back to get it fixed.i have told them I want my car to go to the dealership where it came from,as it’s only 5 mins from my house and I cannot take the time off work.They said no,so beware even if you have a crash that’s not your fault you still have to go to thier cheaper garage,which makes no sense as the other insurance company is paying ! I have informed them I will NOT renew my policy next year. This communication company is NOT good. They avoid claims and make it difficult to cancel renewals. I usually have reasonable experience of the UK named company but I can’t see any connection apart from the logo. Their cover is not worth the paper they are written on. Lineadirecta is the most awkward and unhelpful organisation I have come across in Spain. I tried to get some car insurance from them, was asked for all sort of pictures of the car taken from specific angles and full photos of the front and back of my driving licence, ITV documents and the Log Book. What I joke, I supplied all of these and still have had no contact with them. What a rubbish company, cannot find anyone to telephone to complain. Why are you plugging this bunch. The red phone logo is the only thing they have in common with the completely separate UK Insurer. Honestly there are better organisations out there so do your readers a favour and mention the alternatives. Tthe service from Linea Directa is despicable I have had water leak inside my house for three weeks,impossible to contact them do not answer calls.managed to get through to the car insurance dept. They said didn’t know what was going on in the claims dept and sent 5 emails on our behalf.Got call to say a plumber would call us back .that was 2 weeks ago still no response will be cancelling my policy for sure. I have been waiting since June to have my bathroom retiled after a water leak. Constant phone calls get me nowhere, apart from ‘someone will call you within 36 hours’ that’s a laugh, calls never come. Tried to speak to a supervisor/manager – no luck.